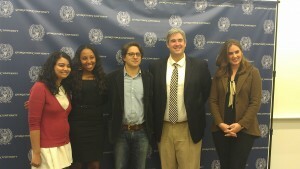 A Nov. 11 SPJ event at Georgetown University in Washington, D.C., served two purposes. First, the audience of about 40 people got to hear from and talk to Pulitzer Prize winners Matt Apuzzo and Adam Goldman about their new book, “Enemies Within: Inside the NYPD’s Secret Spying Unit and Bin Laden’s Final Plot Against America.” It is based on their reporting for The Associated Press. An audience members asked the authors about their approach to talking to sources. Apuzzo’s advice: “Talk casually.” Get to know a source, as if you’re dating. You can’t ask for the “big scoop” when you barely know each other. Apuzzo, a member of the faculty at Georgetown, said government officials consider it “messy and inconvenient” when information gets out – but that’s not a reporter’s concern. “Governing is easier with secrecy,” he said. Trying to navigate through national security documents can be “like wandering in a dark room with a flashlight,” Apuzzo said. Some days, the flashlight doesn’t work. Getting that story exactly right on the first try is unlikely because not all of the details and context will be clear, Goldman said. Apuzzo and Goldman were part of an AP team that won the 2012 Pulitzer Prize for investigative reporting. The team also included Chris Hawley and Eileen Sullivan. 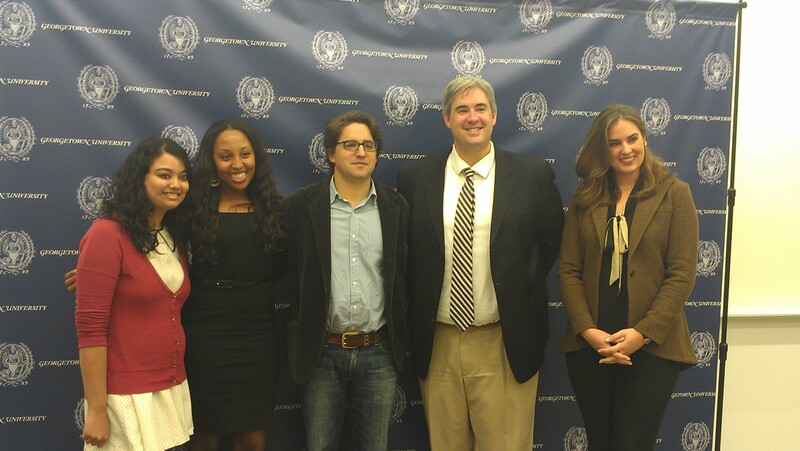 The book discussion event also gave the new officers of the Georgetown University SPJ chapter a chance to get to know each other, a few days after they had been elected. Vice President Mikayla Bouchard and Secretary/Treasurer Nayana Davis are new to the Master of Professional Studies in Journalism program at Georgetown. President Capricia Alston was active in SPJ last year. Welcome, all, to SPJ leadership. From left: chapter Secretary/Treasurer Nayana Davis; chapter President Capricia Alston; Adam Goldman; Matt Apuzzo; and chapter Vice President Mikayla Bouchard. You are currently browsing the archives for the Georgetown SPJ category.